Meet some esteemed names from the world of wine, as we sail through the wine-producing region of Provence. We are delighted to be welcoming some esteemed names from the world of wine on-board, joining us as we sail through the renowned wine-producing region of Provence. Witness the stunning vineyard-laden vistas, with plenty of opportunity to sample the local wares, while enjoying the company of our special guests, all of whom will bring favourite wines from their mothering countries. This exclusive river cruise is the perfect choice for wine-lovers looking to learn more about wine, as we open the doors of world-renowned wine estates like Châteauneuf-du-Pape and Château de Meursault for private tastings. 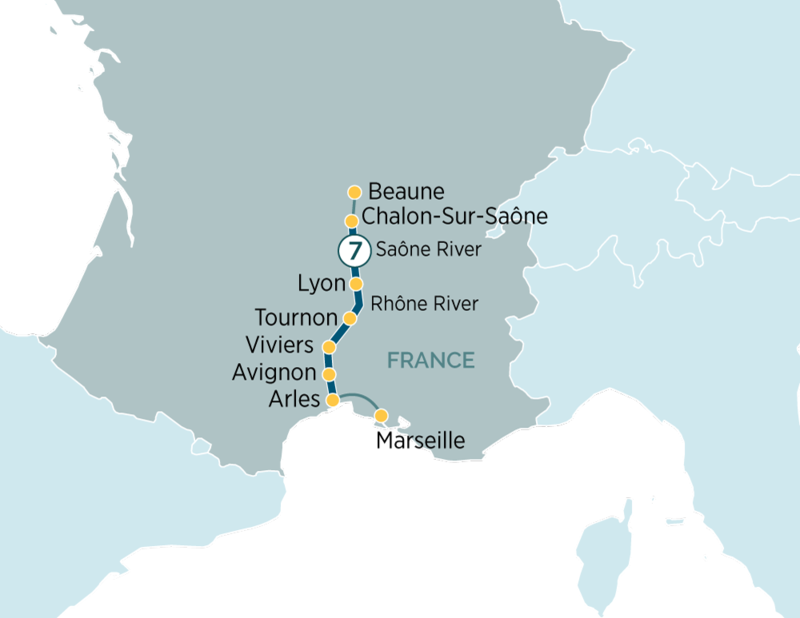 Enjoy Q&A sessions and masterclasses with the experts as you sail from Arles to Lyon, as well as excursions in their company through the breath-taking vineyards of Tournon and informal chats over a glass in the on-board lounge. One of Britain’s leading wine writers and a certified Master of Wine (MW), Tim Atkin was recently named the fifth most influential wine expert in the world. Thirty-three years’ experience and with many awards to his name, he now makes up one third of the ‘Three Wine Men’, hosting engaging wine events around the UK. Starkland Cellar Services provides wine cellar management consultations to restaurants and collectors countrywide, while Starkland Tours organises group wine-tasting bicycle tours in Tuscany,Provence and Burgundy. Robin’s past experience of public speaking means she’s well-equipped to hold her insightful wine-tastings in Southern California, and is often praised for her energetic style. Wine consultant, writer and highly regarded speaker, Andrea Pritzker MW has had a varied career within the wine trade. Born and raised in Toronto, Andrea obtained her diploma in Wine Commerce in Bordeaux, before moving to Sydney in 2003 and founding her very own wine education and events business, Wine inTuition. You will be met at the airport in Marseille and transferred to the Emerald Liberté luxury star ship in Arles where you will be welcomed by your Captain and crew. Tonight, enjoy a welcome reception and dinner on board. All our holidays are subject to availability. Price shown is per person based on two people sharing our lead-in, lowest priced cabin and includes relevant discounts. Supplements apply for single travellers, upgraded cabins and other departure dates. We reserve the right to withdraw our offers at any time.